It only took me somewhere around 365 days (give or take), but I did it. I finally finished a table runner for Mom. It’s fall themed and has some really beautiful orange colors in the fabric. I blogged about it last year, a table runner as tall as me, but then the project died. Why? Because, of all the silly reasons in the world, I messed up a couple things and had no idea how to fix them. I really thought this would be a dead forever kind of thing, until a friend of mine gave me a solution and the motivation to finish it. The long and the short of the problem was that I had decided I wanted to quilt it, but this was before I knew very much about quilting. OK, I didn’t know anything at all. I didn’t know how to go about backing and binding it. So I cut my backing to the exact size as the front. After doing that, then I realized that I didn’t have a piece of batting the length I needed. A year ago, those two things stumped me completely. The solution? I ignored the batting and quilting completely. I simply sewed around the edges, turned it right side out and top stitched the edges. Simple. And done. Oh, and I added tassels. Just because it made me happy. Sometimes I get so hung up on following through that I forget I can make changes, if that’s what it takes to get it completed. Out of all this, there really two important things: I finished it and Mom likes it. Mission accomplished! 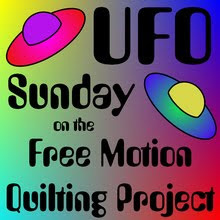 I’m linking up with Leah Day for UFO Sunday!